2. In a separate bowl, whisk oil, buttermilk and egg; pour this over reserved flour mixture. Stir lightly with your fingers until the ingredients come together to form a fairly smooth dough. If your dough is too soft, add extra flour until you reach the desired consistency. Your dough should be soft, slightly tacky, but not sticky. 3. You will now have to divide that dough into 3 unequal pieces: one which will be approximately ¼ of the recipe; then divide the rest in half to get your other two pieces. 4. Form each piece into a thick disc and wrap individually with plastic wrap. Refrigerate while you work on the filling (or at least 30 minutes). 5. Coat a large, heavy pan generously with cooking spray or olive oil and heat over very high heat. 6. While this is happening, mix all the spices together in a large plate. Dredge the chicken legs in that spice mixture making sure that all sides are well coated. 7. Add the legs to the hot pan and sear them nice and good on both sides, until a nice crust forms, about 3-4 minutes per side. 8. Transfer the legs to a large stock pot, cover with water and add the leftover spices that didn’t get used to coat the turkey legs. 9. Bring that to a boil then lower heat, cover partly and simmer until meat falls loose from the bones, about 2½ to 3 hours. 10. Remove the legs from their cooking liquid (but do not discard it) and allow them to cool for a while, until you can safely handle them and remove all the meat from the bones. Discard bones; set meat and cooking liquid aside in separate containers. 11. Cut the turkey breast into small cubes and grind it in 2-3 batches in your food processor, on pulse, until it has the consistency of ground meat. 12. In a large saucepan, cook the onion over medium high heat until it takes a slight golden coloration and becomes fragrant. Add spices (from salt to rosemary) and ground turkey meat and continue cooking until meat turns completely opaque. Add orange juice, vanilla extract and 1 cup of the cooking liquid. 13. Cover loosely and simmer over low heat, stirring from time to time, until the liquid is almost completely evaporated, about 30 minutes. 14. Add meat from turkey legs, another cup of cooking liquid (or water) and resume cooking, stirring from time to time, until meat starts to fall apart and once again, liquid is almost completely gone. 15. Add buckwheat groats, apricots, prunes and chestnuts, as well as another cup and a half of cooking liquid (or water). Resume cooking until all water is absorbed and groats are fully cooked. Stir in pistachios and set aside to cool. 17. On a floured surface, roll out the 2 larger dough balls to form a 25-27 cm disc. Fit into two 22cm deep pie dishes and let excess hang to the sides. 18. Divide meat filling between the two pies and fold excess dough back over the meat. 19. Roll final piece of dough on a floured surface and cut out shapes with a cookie cutter of your choice. 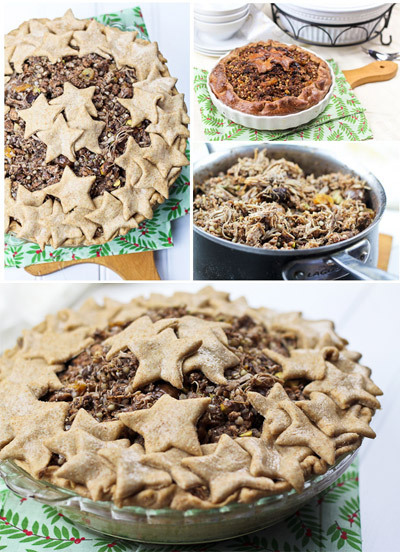 Arrange cookie cut-outs in a pretty fashion around the crust and/or in the middle of the pie. To insure proper sticking, you may brush the back of your cut-outs with a tiny bit of water or milk. 20. Place in the oven and bake for about 25 minutes, until the crust gets really nice and golden brown. 21. Serve immediately… or on Christmas night!